This is going to be a brooch. 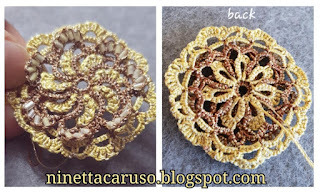 The tatting pattern is my attempt at design with the multilayer technique that is very popular among those who do ANKARS's style. 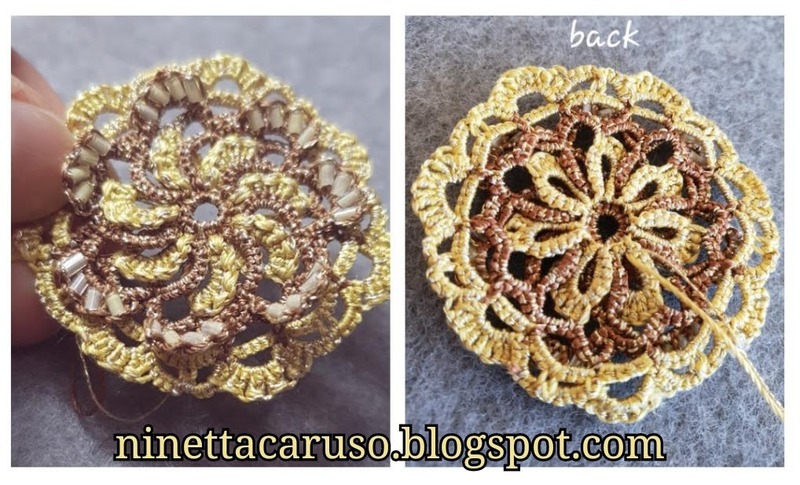 It is very simple in this case, the centre is in 2 parts that are layered afterwards, and actually joined while tatting the outer round. I need to understand better that method, something still in my list of techniques to learn. 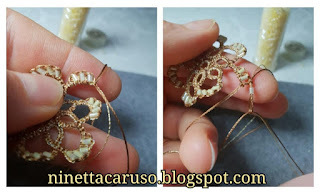 I like that "light ANKARS style", not so many beads on it, in this way tatting is highlighted more than beads are. 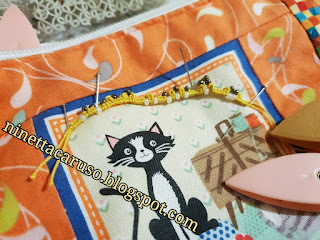 All layers feature treble tatting. That is, I tatted the first part of the treble but then, I put a bead over the loop, and slip the shuttle through the loop. Stop it in that way, don't roll. 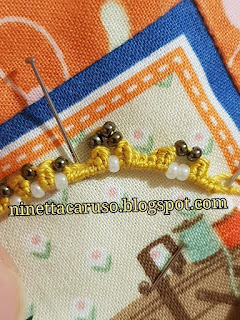 The method described is only a different way I tried, to combine treble tatting and beads, than the usual methods we use when tatting double stitches. 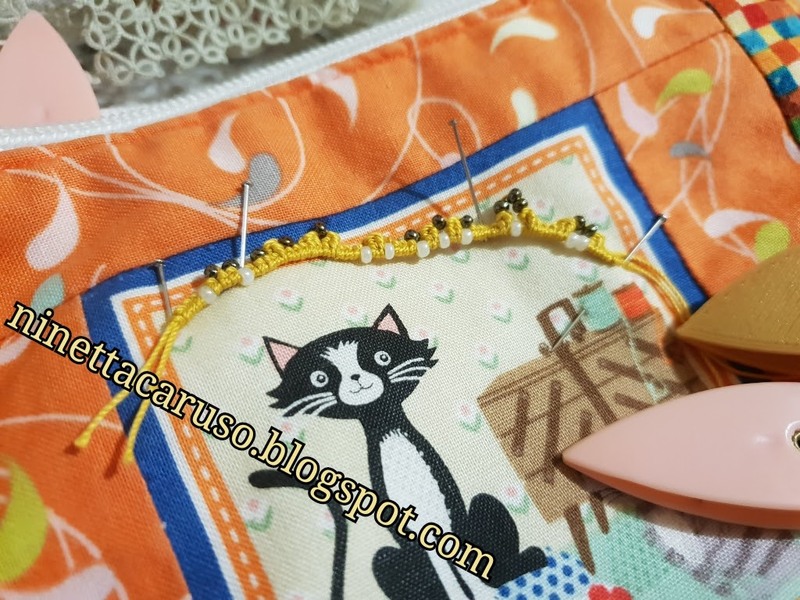 The more I play with tds, the more I discover analogies with all tatting I've used to do. That is very intriguing and challenging. I loaded 2 shuttles with beads. Core shuttle has white beads, second/ball shuttle has bronze beads. 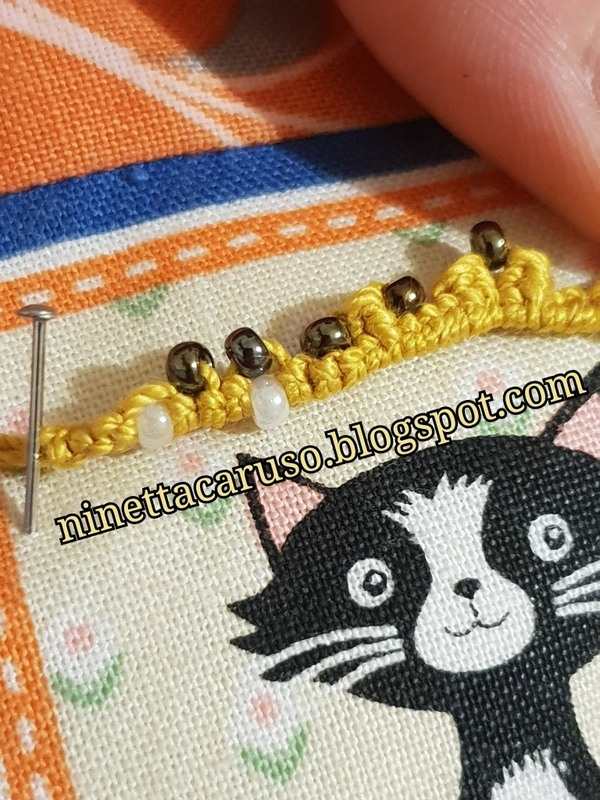 In the next pic, you can recognise (from left to right) a bead (white) in the core thread, then a bead (bronze) in the picot/ball thread, then one up and one down beads (as they are called in beanile lace). Then, following: a bead (bronze) in the vsp, a tds started from that vsp, another bead in the following vsp, and that is the effect of a tds surrounded by 2 beads; then one tds, a bead in the vsp for the second tds, and that is another effect of a bead between 2tds. We can also put beads up and down, before, between and after tds. You just put beads in the vsp needed to start the tds or in the vsp right after the tds. 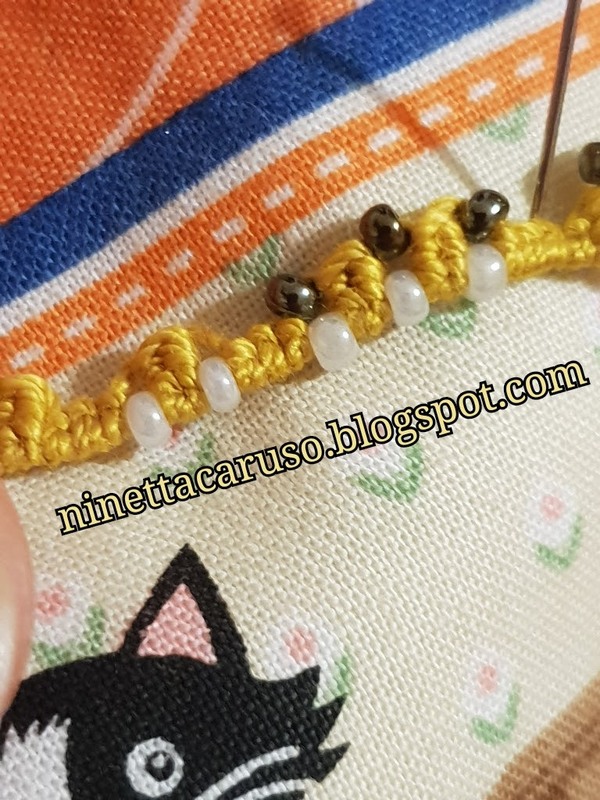 In the next picture, there is up+down beads, then 1tds (vsp for this, is the space between white and bronze beads), up+down beads, then 1tds, up+down beads, then I continued the chain with some ds. 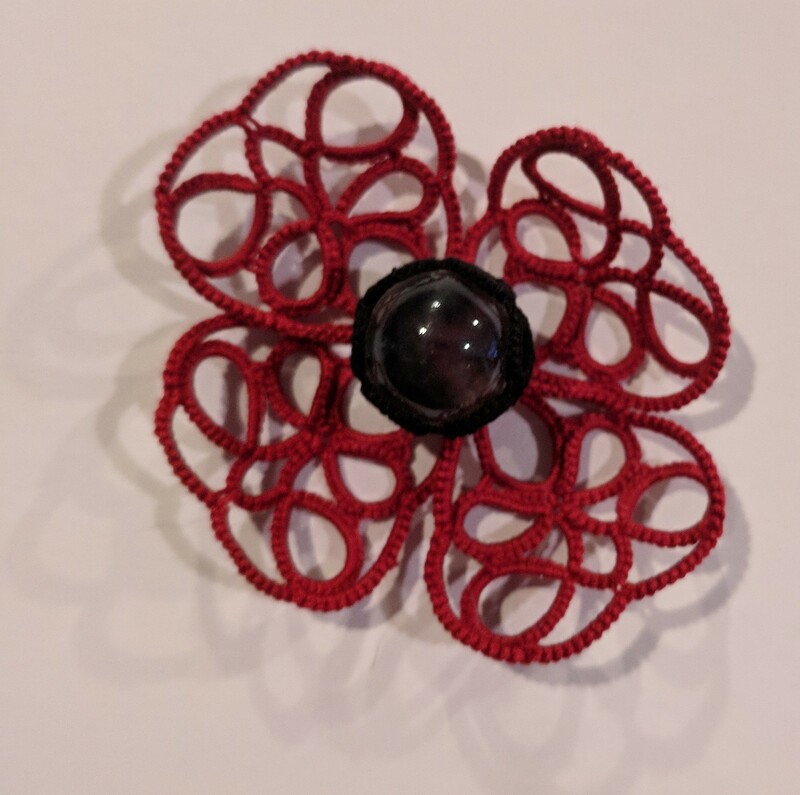 Only remember that the vsp is the first step in tatting a tds and beads can be put in that vsp. Or, when passing from a tds to a normal ds, in the vsp left after the tds, same height, before the ds. One can also put beads over (not loaded) a picot and then use it for joining. The vsp in the tds can be longer enough to host a bead over it in a next round, for example. Many possibilities. 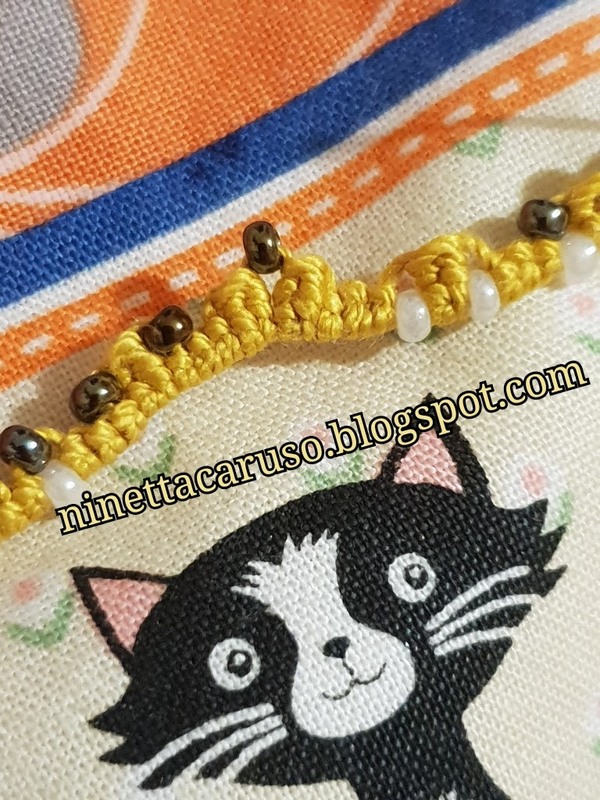 There are tons of patterns for tatting with beads. 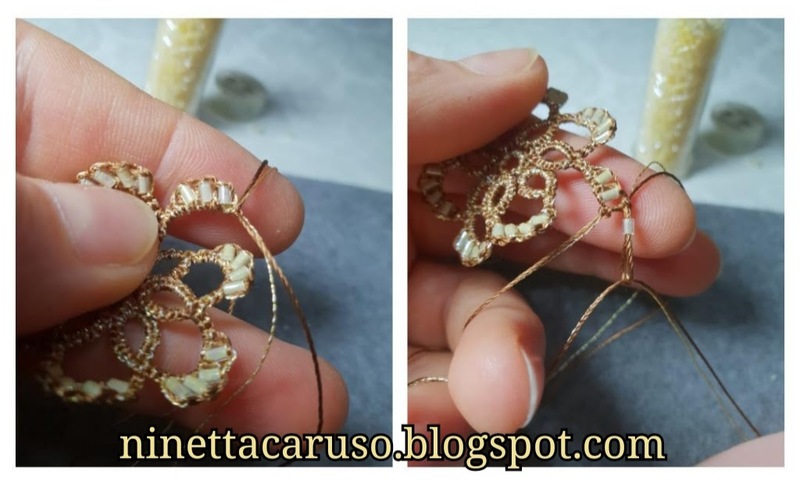 The tds tatting may look like only a little change from normal rings and chains with ds, but sometimes a little change could mean a great opportunity. Have fun double - or better, treble. I love your creativity! I must try this out! 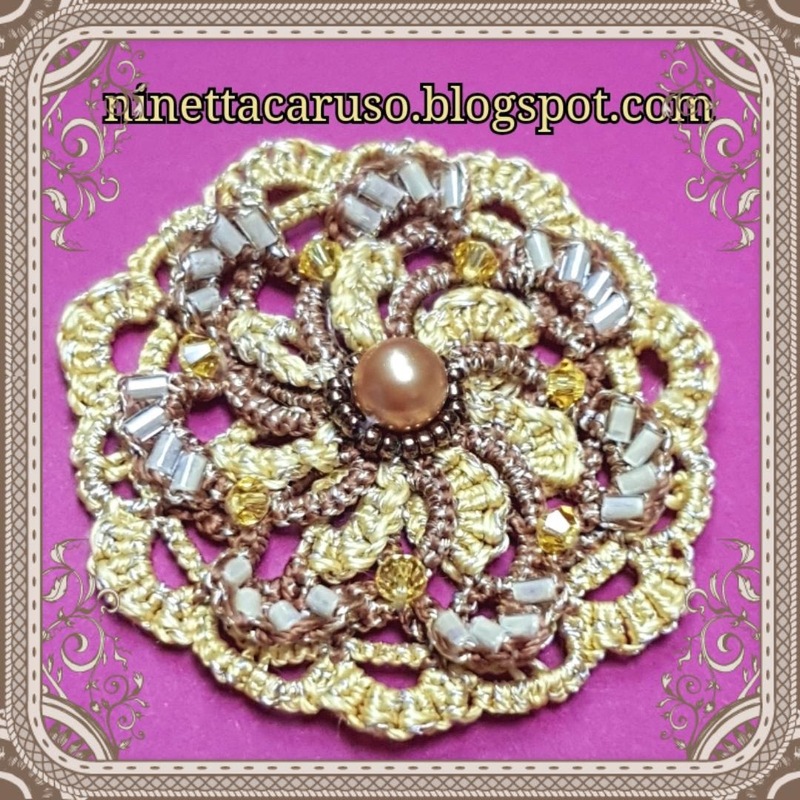 This brooch is so elegant, I love the trebles and the swirling movement! Gorgeous! :X :-f thank you dear Fox! 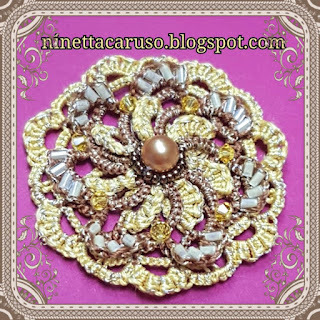 Fabulous brooch, I love your combination of beads and different stitches. 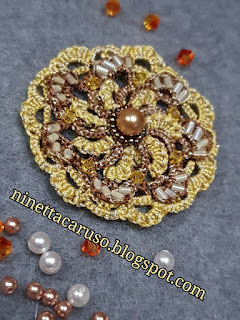 The brooch has wonderful texture, with the treble tatting and beads.